NOAA scientists flew multiple missions into Hurricane Michael in the days before landfall, closely observing the rapid intensification of the storm. Their tools included a small unmanned aircraft, called the Coyote, which flew into the strongest winds of the eyewall as the storm intensified to a category 4 on the Saffir-Simpson scale. 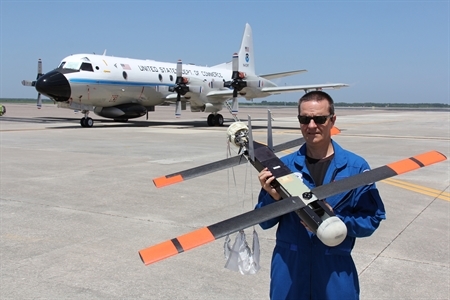 NOAA has flown small unmanned aircraft in several hurricanes, including Hurricane Maria in 2017, each time further pushing the limits of how much turbulence and wind it can handle as it sends measurements of wind speed and direction, temperature, air pressure, and moisture that scientists need to better understand, model, and forecast rapidly intensifying storms. In Michael, hurricane researchers with NOAA’s Atlantic Oceanographic and Meteorological Laboratory were able to successfully fly the Coyote in the extremely strong winds of the eyewall, measuring winds up to 183 mph at 2085 feet of altitude. Hurricanes like Michael are exactly why NOAA is using such new approaches to observe storms, to help advance hurricane models so that forecasters can provide as much advance warning as possible of the expected storm intensity and conditions. Observing the hurricane boundary layer, the lowest thousand feet or so of hurricanes, will help us improve rapid-intensity forecasts. “Knowing this unmanned platform is capable of withstanding such turbulence and wind speeds gives up hope that we can rely on this approach to collect observations in rapidly intensifying storms,” said Joe Cione, NOAA scientist. “These observations can help us improve models that inform forecasts that evacuation decisions are based on."